InSanity lurks Inside: Canada's Wonderland- New Waterslide Arrives? 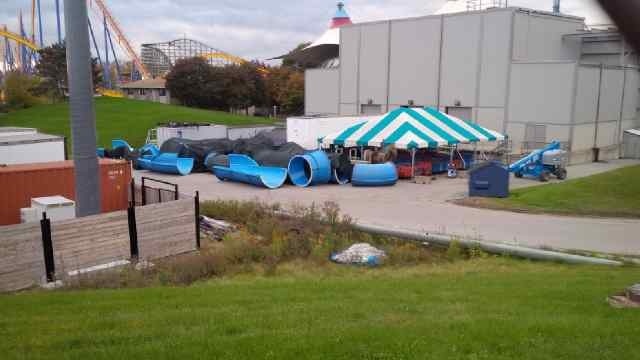 Canada's Wonderland- New Waterslide Arrives? Today over on CWMania I spotted this. Now, it's not hard to deduct that this is.. A Waterslide! The interesting part of this is- Canada's Wonderland wasn't slated for a new waterslide this year. Not a peep about even improving their Splash Works water park. When someone reported spotting these, it caught my interest! So I went digging to find out what this was all about. Also by browsing around on CWMania (seriously, those folks know!) 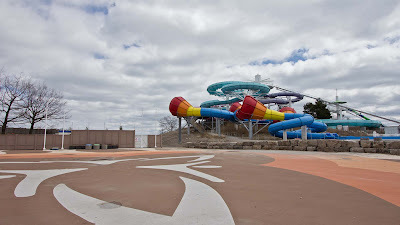 and discovered many people believe this is the 'Slide that Never Opened' at the failed Soak City in Ontario, Canada. Another rumor I've heard for a few months now says that Splash Works may be in for a 2015 overhaul and this used slide could be part of that. It's really rather a smart idea on the part of Canada's Wonderland. These things cost upwards of $100,000 each to build. 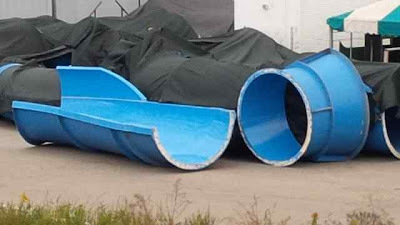 With many Water Parks disappearing and other just removing slides they can't either maintain or want removed for something new- this is a great way to add to you park without busting your budget. Remember- Something.. Anything new will get people through the door! This is an image of what may suspect this mystery slide might be. The 'Built but Never Opened' also called 'Tospy Turvy'. The downside is no one can seem to 'find' the red, orange and yellow sections of the slide. Perhaps they are being stored inside or elsewhere. Frankly, I can't tell you. Either way, it still appears the Canada's Wonderland will receive from for of new waterslide in the near future!